You are what you think about and you get what you expect. Think and expect the best. Remember when Bill Clinton was referred to as "Teflon Bill"? It seemed as if all the bad stuff just slid right off of him. Whether they were fans or not, many people envied that he had that quality and probably wished they had it too. But what about you? 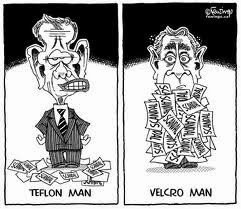 Which are you...Teflon or Velcro? I think too many of us would consider ourselves Teflon for good things and, unfortunately for us, Velcro for bad things. We believe that any good fortune that comes our way never sticks to us. But let something bad show up and it sticks to us like...well...like we were covered in Velcro. If you are someone who believes that good things don't show up in your life, why not try envisioning yourself covered in Velcro. Then when something good is on the horizon, imagine it sticking to you. The same goes for bad luck. Imagine it sliding off of you just like the eggs slide out of a Teflon frying pan on TV commercials.